As the epitome of the cool, dark, and tortured anti-hero, Sasuke Uchiha is the shinobi that 99% of Naruto fans either want to be or want to be with. He’s so cool he makes Naruto and everyone else in the franchise look like a chump. We buy toys, figurines, and statuettes of such characters because, by displaying them on our desk or cabinet, some of their coolness rubs off on us. That won’t work, though, if the product on exhibit is a bootleg. Counterfeit items are notorious for being of inferior quality in every aspect, so much so that they’re more a mark of shame than a source of pride. 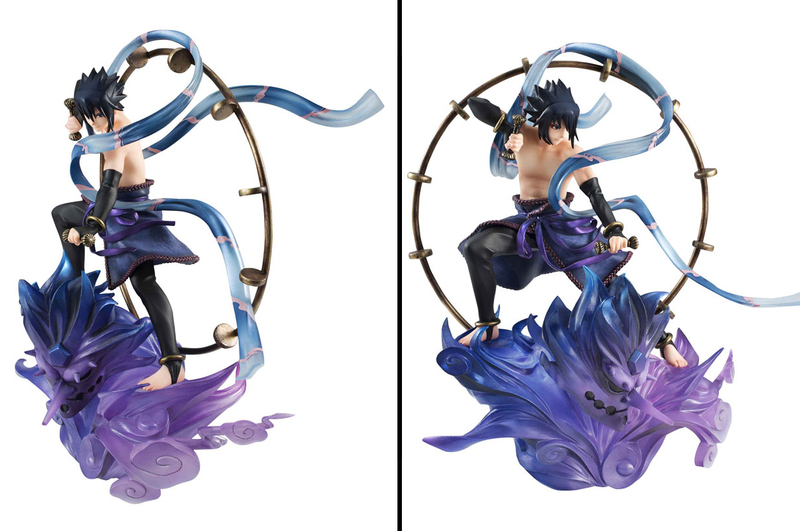 Itching to own a gorgeous statuette based on your favorite anime property? Well, eBay is not the place to do your shopping. For years, the online auction service has served as a haven for merchants with nothing but bootlegs to trade. Some sellers may seduce you with pretty pictures of their products, but what you get is often less than what you expect. 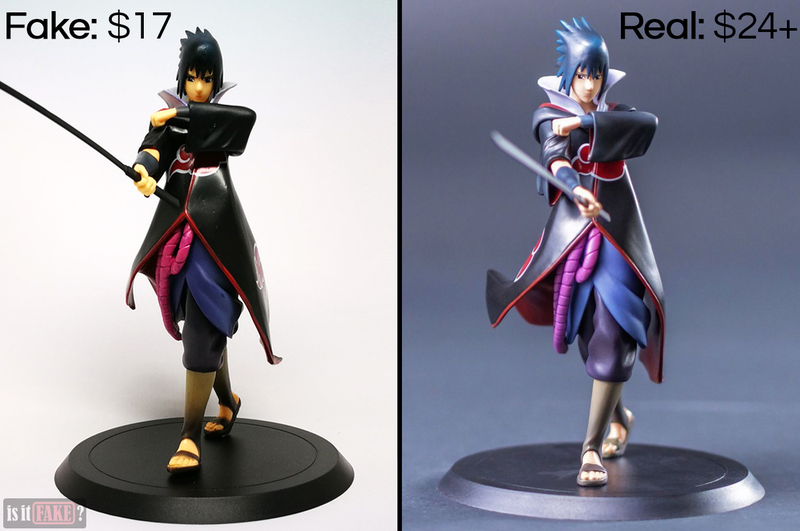 Needless to say, we acquired our fake Sasuke Uchiha figure from eBay. As expected, the item is far more disappointing in hand than in the photographs. But don’t take our word for it; read on and see for yourselves! 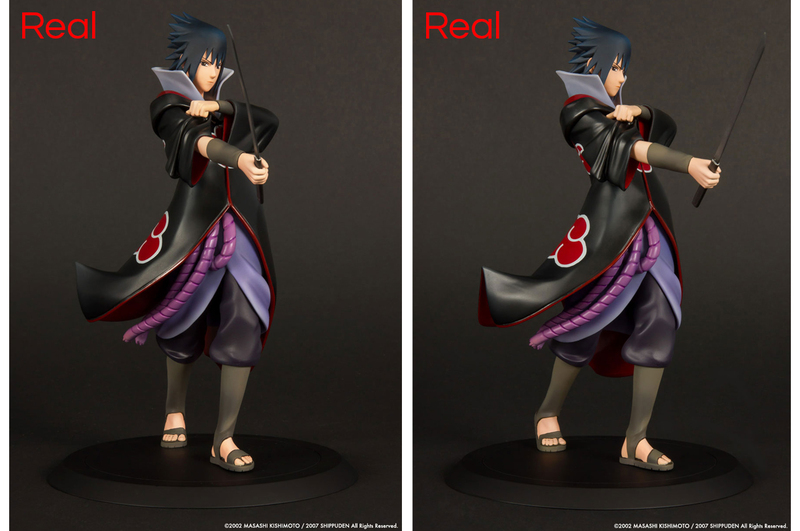 First things first – if an anime figure doesn’t come in a box, it’s either secondhand, or in the case of the Sasuke Uchiha figure we acquired, a fake. Needless to say, this bootleg was only wrapped in plastic when it arrived on our doorstep. The figure itself is best described in one word: unexceptional. 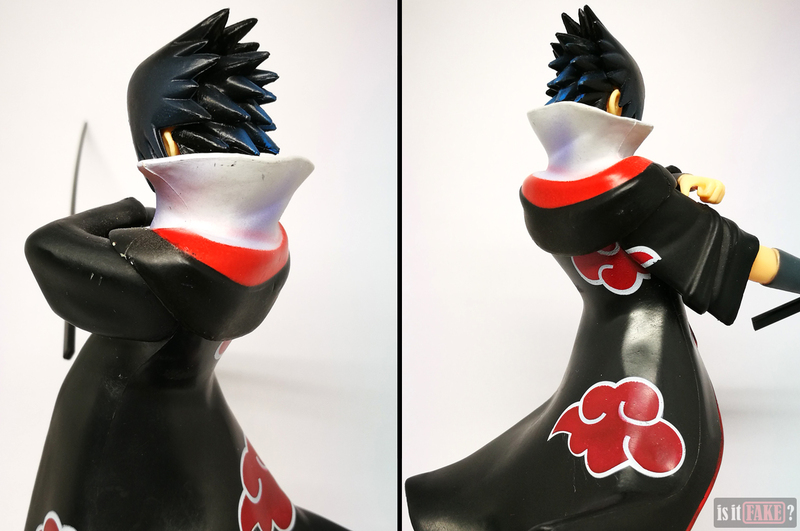 This figure was based on a licensed product from manufacturer Tsume. All figure collectors know that it takes more than the sculpt to make a good figure. While the official item delivers on all fronts, the fake fails on almost every aspect. 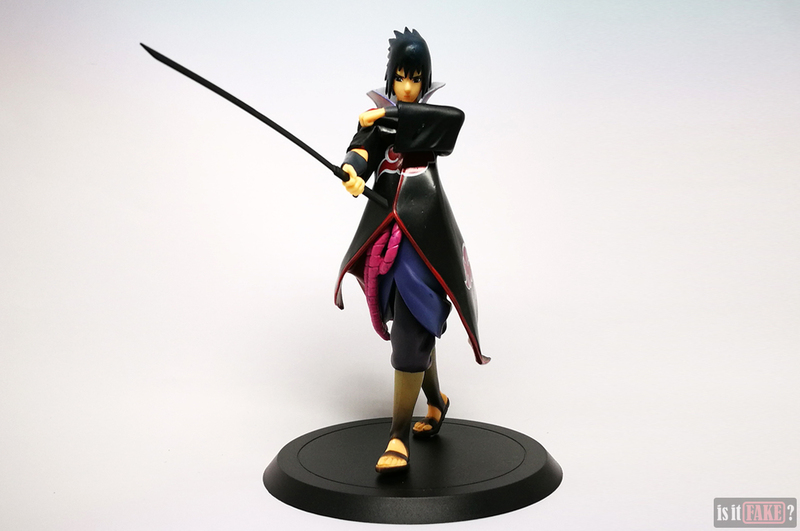 To get us started, let’s look at the official Sasuke Uchiha X-tra figure from Tsume. As you can see, the official figure’s colors differ from the fake’s. 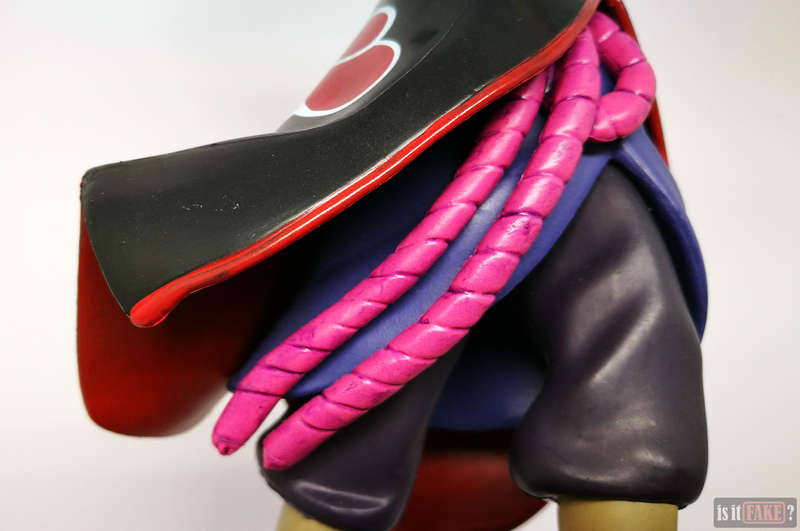 For instance, the official figure’s hair has a rich amount of blue evenly spread over the surface. The fake has a lot of blue on the back of the head, but only a hint of it on the front. The fake’s skin is sallow, giving Sasuke the look of someone suffering from jaundice. 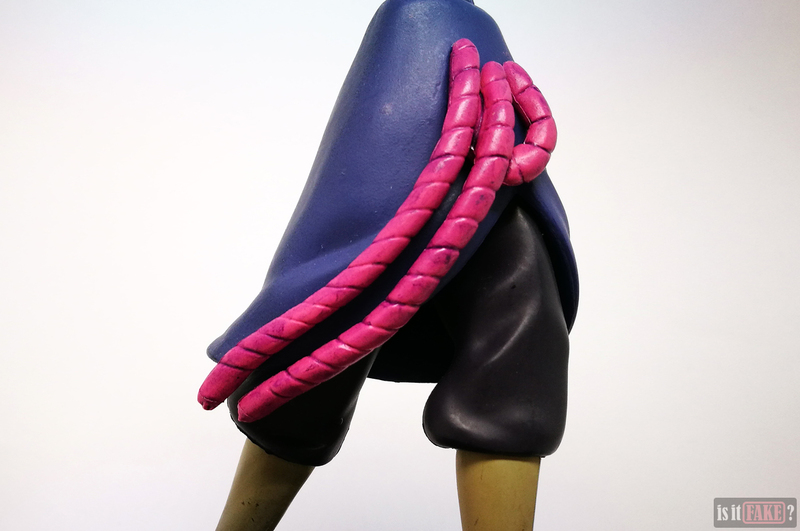 The rope hanging from his hip is a bright pink when it should be purple. His skirt is more blue than violet, and his socks are a dirty yellow. Speaking of dirty, the fake’s paintjob is marred by an ungainly variety of blemishes. You’ll see dark dots and sprays of blue on the white collar. The skirt, rope, pants, and socks are all stained with random splotches. 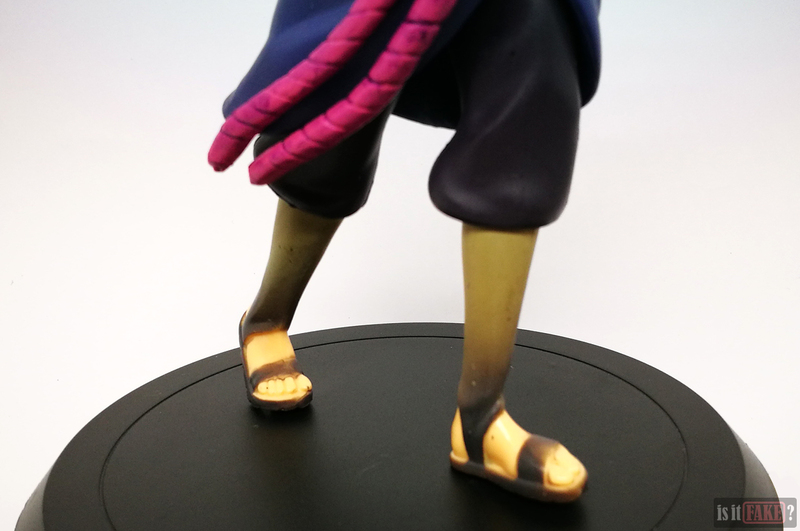 Some parts, such as the sandals, feet, and arm bands lack color in specific areas. Some paint applications don’t stay confined within their details, but leak onto neighboring regions, making for a messy, amateurish paint job. The paint details on the fake’s face are also less sharp. 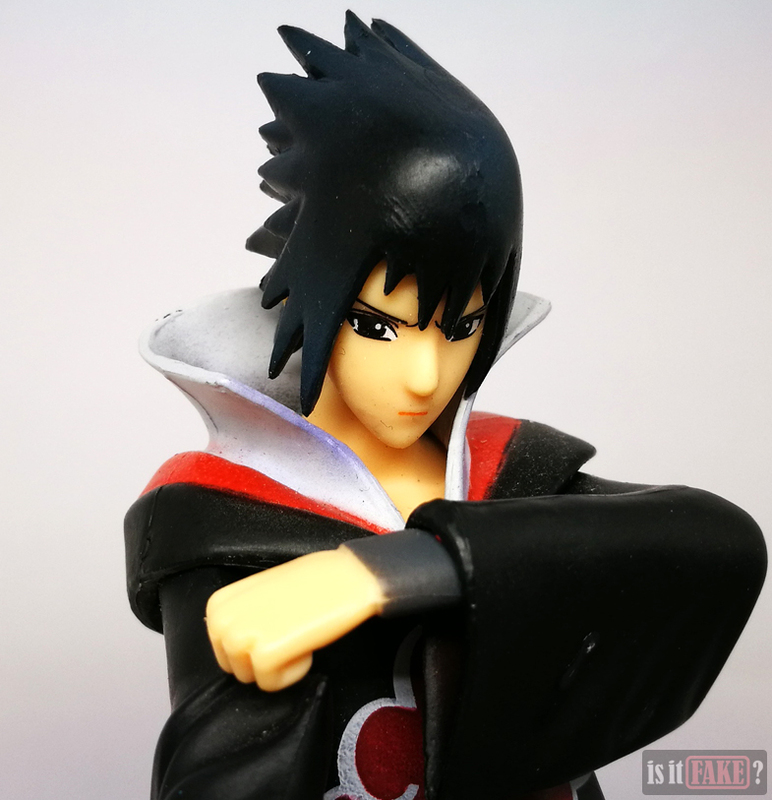 They even give fake Sasuke larger eyes. Upon closer inspection, you’ll notice the fake’s sculpt is also problematic. This is most evident in the hair. On the fake, the separate locks have rounded edges and tips. This, in combination with the ugly coloration and glossiness of the plastic, makes the back of his head look like a bed of leeches. 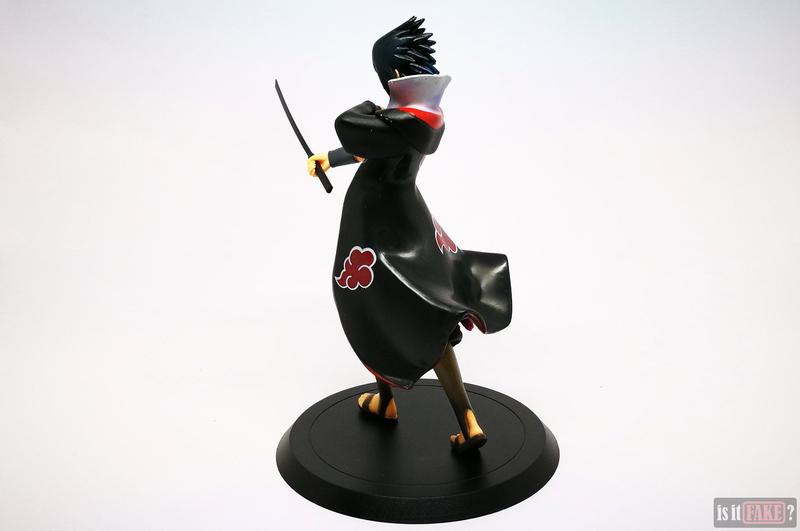 In contrast, the official figure’s hair boasts sharp contours and pointed tips. 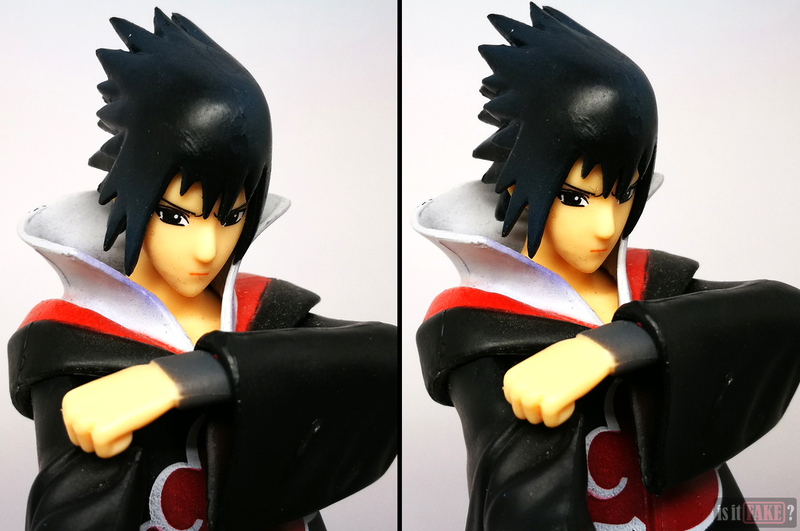 These extremely conspicuous edges make legit Sasuke’s hair look sleek and extra stylish. The tip of the fake’s nose is also more rounded. 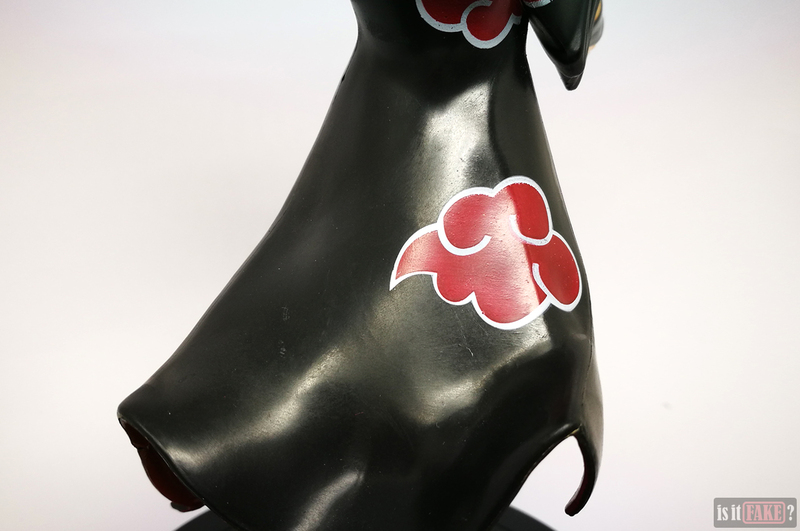 On fake Sasuke’s left sleeve is a huge ugly blob of plastic that’s impossible to not see. If you look closely, you’ll discover smaller deformities all over the place. 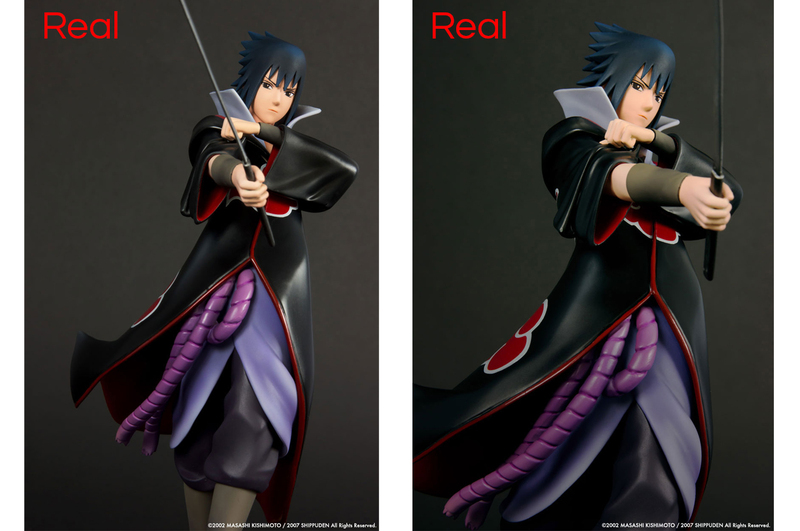 Fake Sasuke’s plastic is also uniformly glossy. Under the light, it gives off an almost slimy sheen – even his skin. Lastly, there’s the issue of fake Sasuke’s sword being bent and extremely soft. 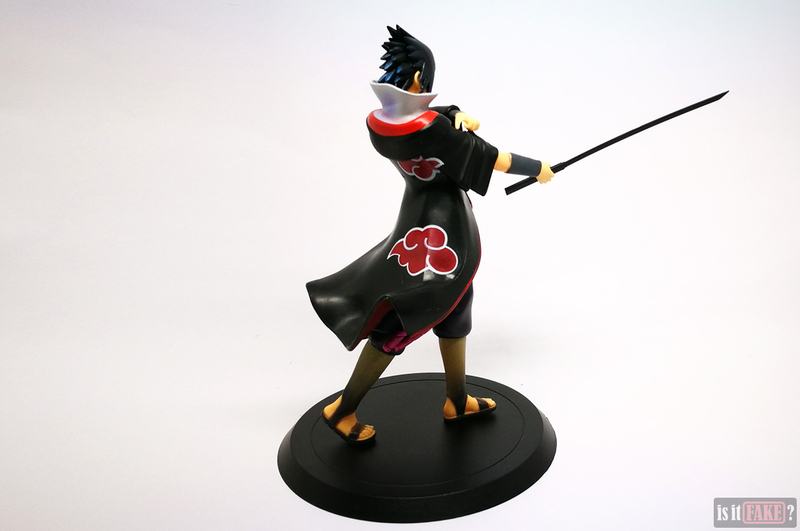 It’s also black, in contrast to the silver sword that comes with the official figure. 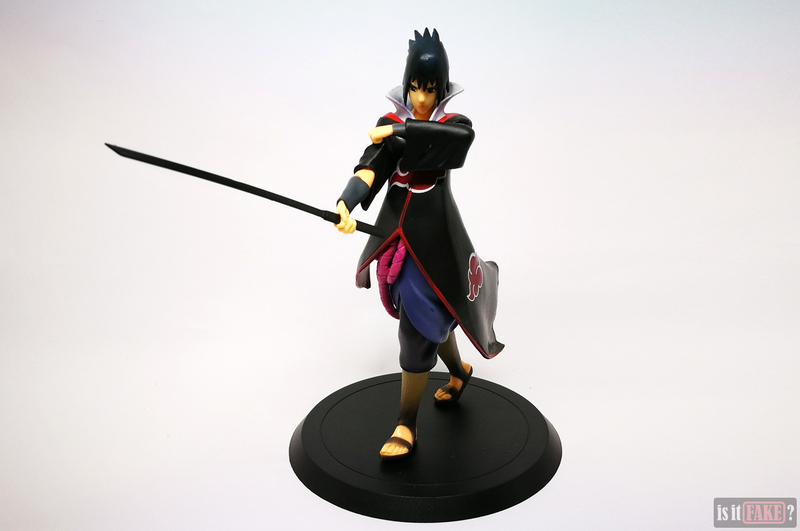 According to Tsume, the black sword belongs to an ultra limited edition of the Sasuke figure sold during the Tsume Fan Days. In addition to having a black sword, this special figure features the character in Sharingan mode, so his eyes are red. 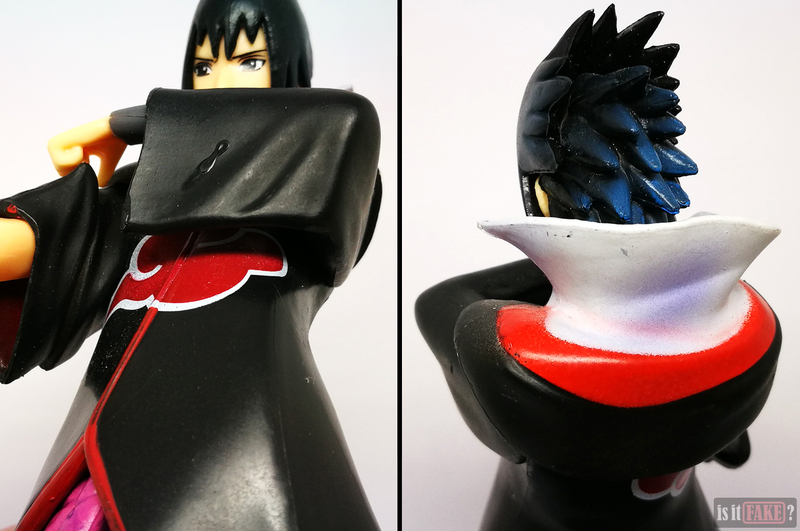 The bootleg therefore combines features of Tsume’s regular Sasuke (black eyes) and limited edition Sasuke (the black sword). 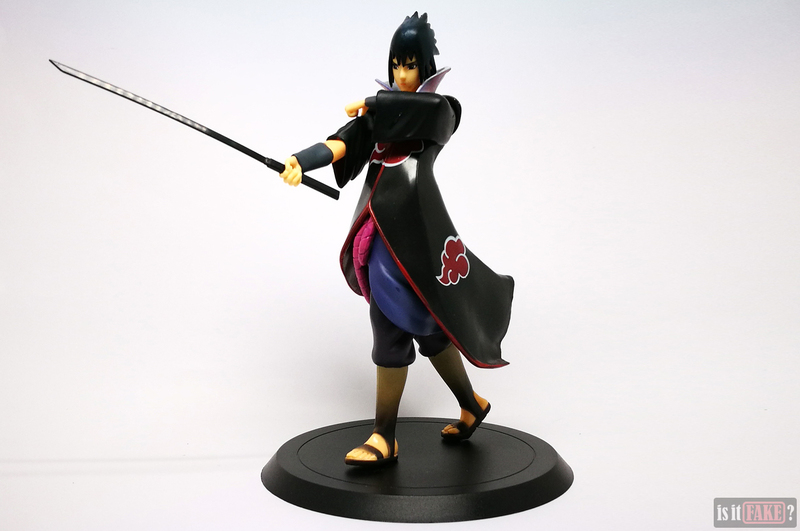 Let’s look once more at pictures of Tsume’s official Sasuke Uchiha figure. The material used for official Sasuke’s clothes don’t give off a wet gleam; the light scatters smoothly on the surface. His skin has been given a matte finish, so he doesn’t shine as if he’s sweaty or his flesh is melting. 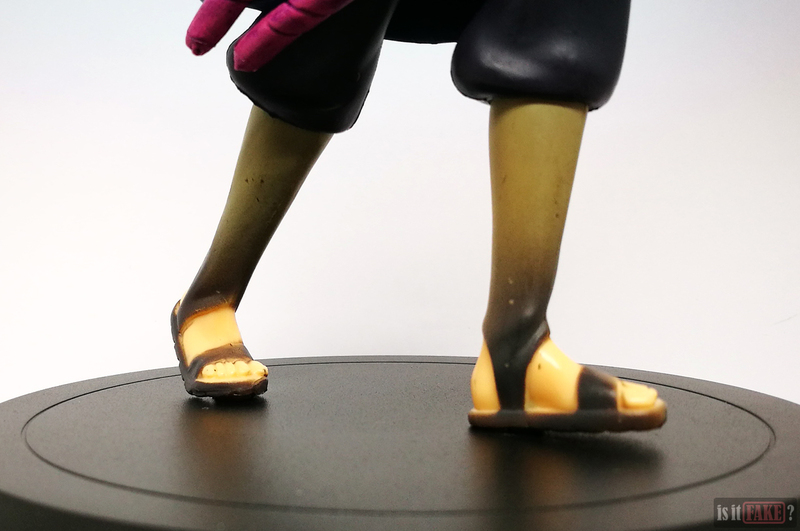 In fact, everything about the official figure looks clean and polished – from the paint, to the sculpted details, to the material. Here’s the bad news. This figure was released way back in 2013, and only in limited quantities. 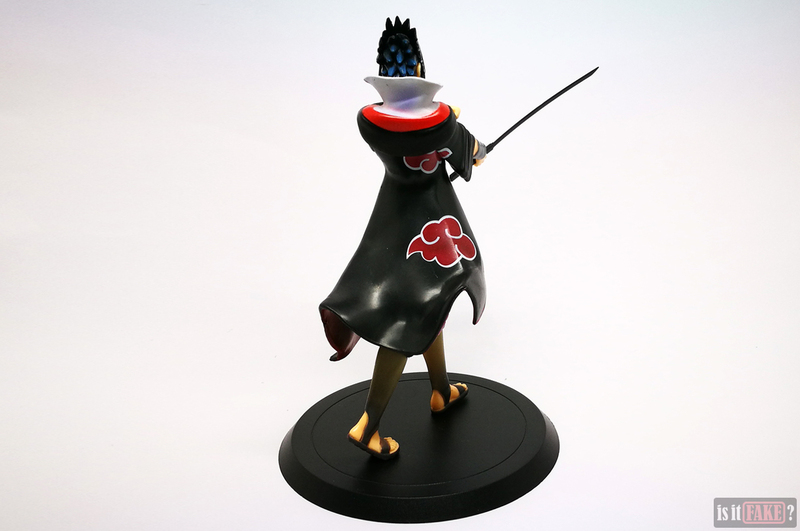 It’s sold out on Tsume’s online shop, and you’ll have a tough time finding it on any other online store. Is there any good news? Indeed there is! 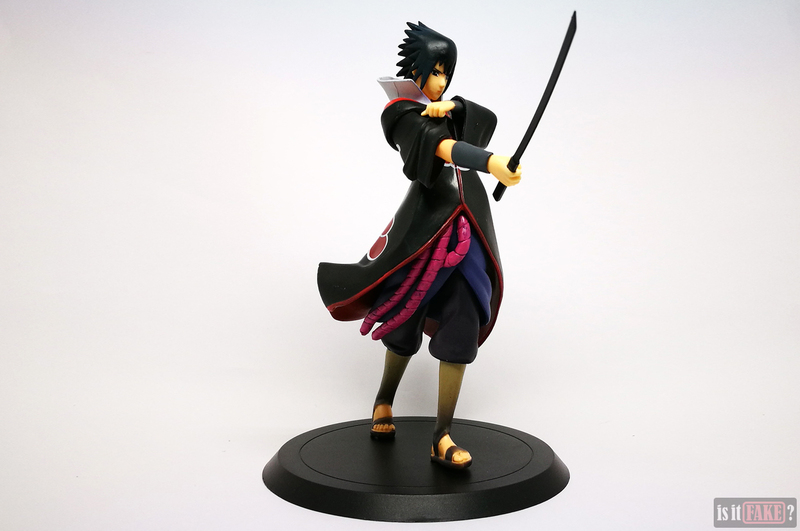 The character is megapopular; that means there’s a surplus of other Sasuke figures out there. You just need to know where to look. Paying $17 for a lousy fake is tantamount to setting your wallet on fire. Don’t do it. 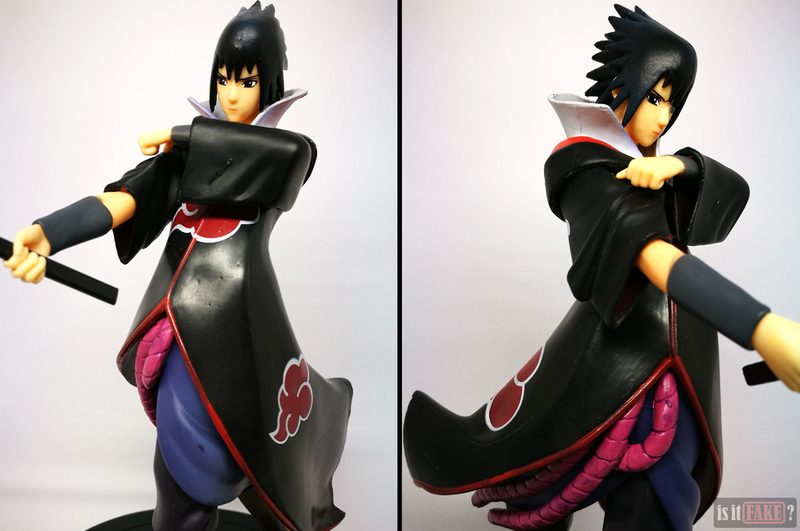 If you’re going to spend your money, spend it on something of high quality, like an officially licensed Sasuke Uchiha figure. 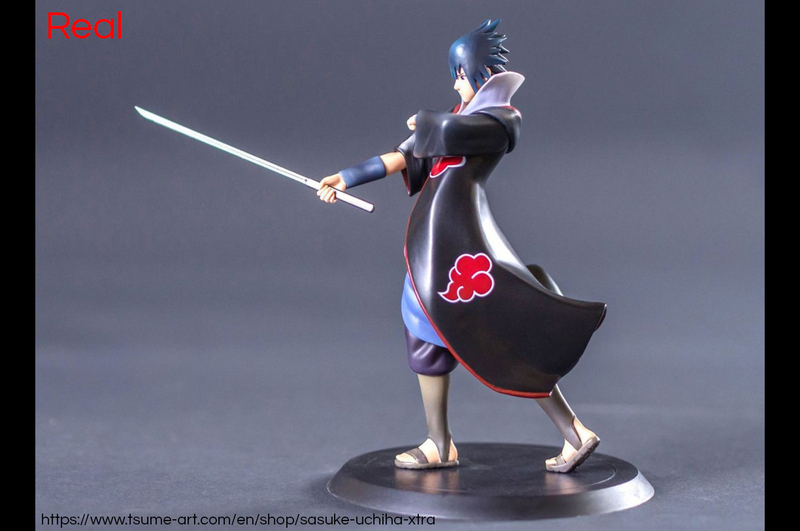 The goods news is that there’s a wide range of licensed Sasuke figures available online, and at least one of them is selling for as little as $24. 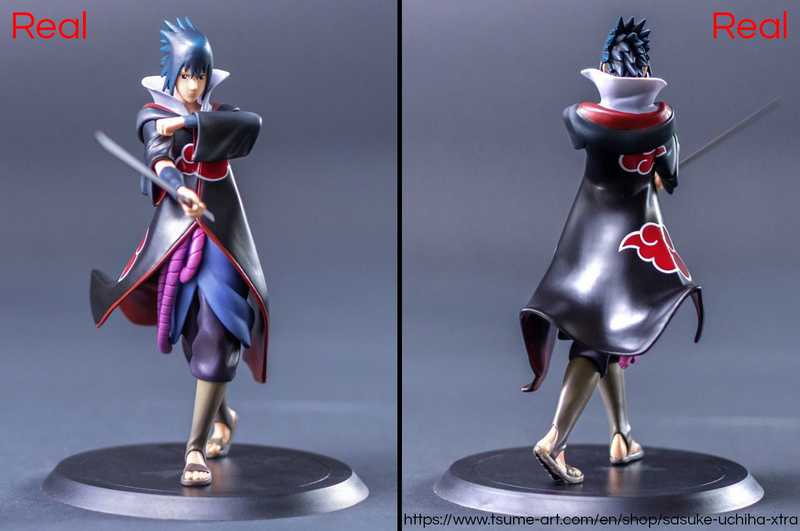 Tsume’s Sasuke Uchiha X-tra figure may be long gone, but they recently released a new, similar-looking Sasuke statuette. 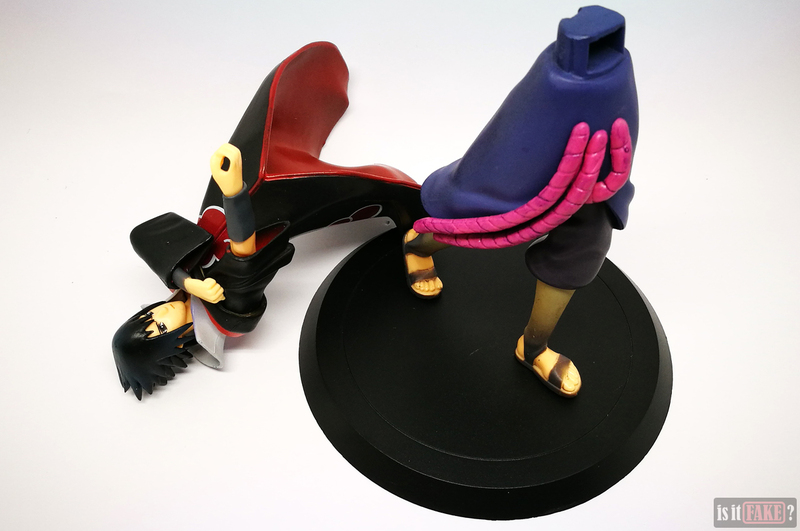 It’s 1/12 in scale, and you can purchase it from Tsume’s online shop for $24. If that doesn’t float your boat, there’s Banpresto’s Sasuke figure from their Naruto Shippuden DXF Shinobi Relations line. Banpresto doesn’t have an online shop, but they do provide a list of approved physical and online toy stores that sell their products. 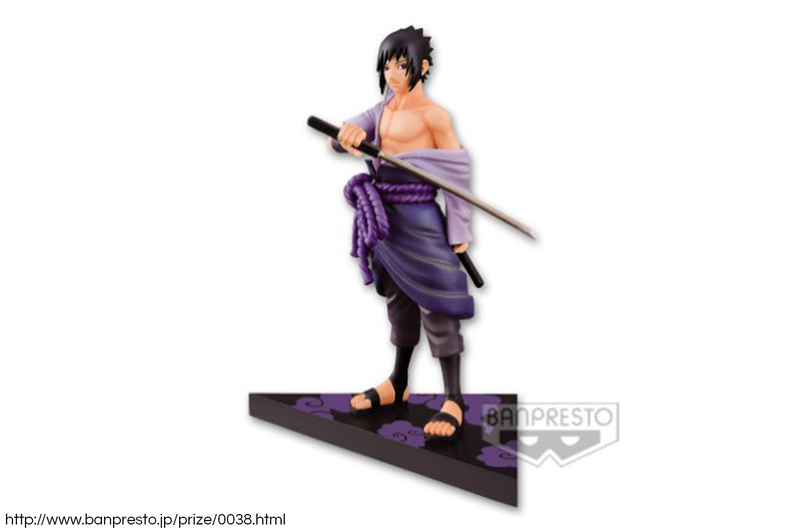 If you’re therefore searching for Sasuke figures by Banpresto or other manufacturers, you can expand your search there. Just select your country, visit the store’s official website, and start toy hunting! And don’t worry if an item you’re looking for is currently out of stock – just request for a special order from the shop. The most popular shops are in constant communication with official toy manufacturers and distributors, so it’s possible they’ll be able to find you the figure you need. 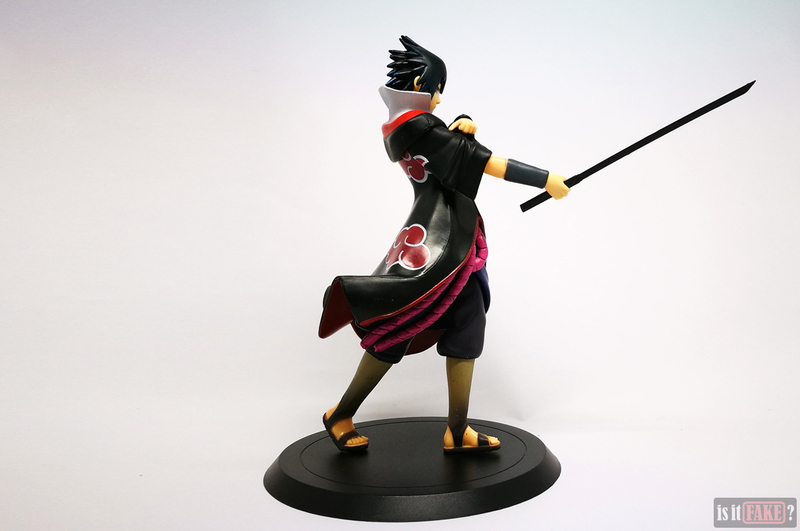 One of those shops is AmiAmi, which boasts a gargantuan catalog of licensed toys from Japan – including this gorgeous Sasuke figure from Megahouse. 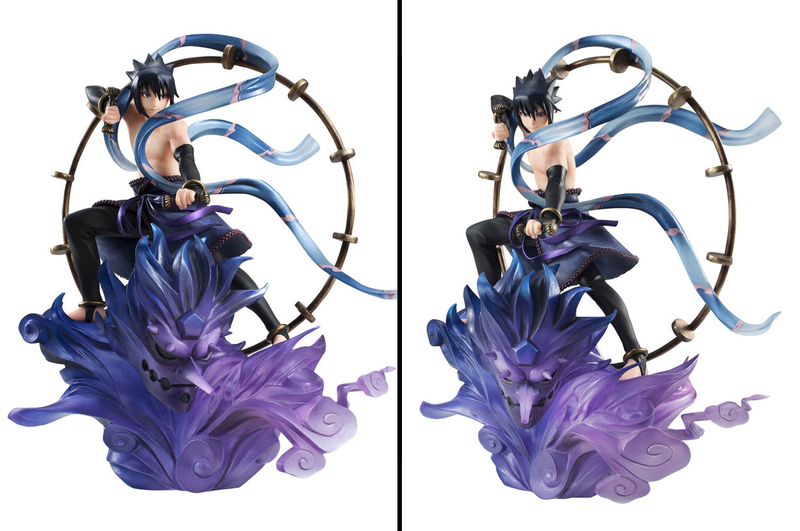 This is Megahouse’s Naruto Shippuden: Sasuke Uchiha Raijin Complete Figure from their G.E.M. Series remix line. As you can see for yourselves, it’s a fantastic display piece, from its eye-catching colors, to the exciting pose, to the intricate details. It even stands at a whopping 18cm tall. Because it’s such a top-quality product, this figure is going to cost you a little bit more at $76. 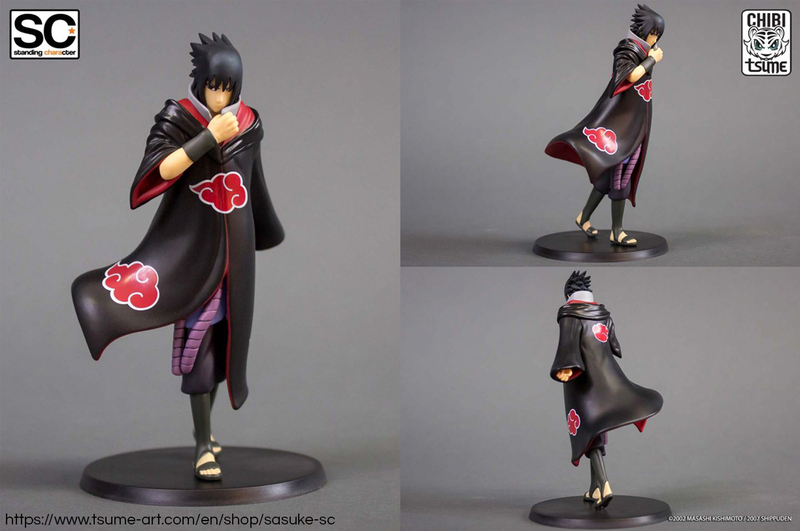 But if that isn’t the version of Sasuke you fancy, there’s Megahouse’s Naruto Shippuden: Itachi Uchiha & Sasuke Complete Figure, also from the G.E.M. Series. 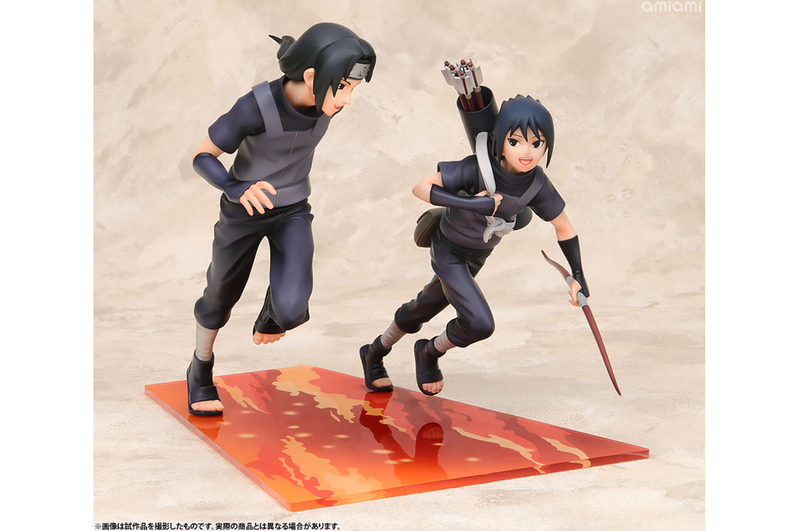 This consists of not one but two figures: Sasuke as a child (11cm), sharing a happy moment with his older brother Itachi (15cm). This is another beautiful, high-quality product from Megahouse, and a must-buy for long-time fans of the series. It costs $106. 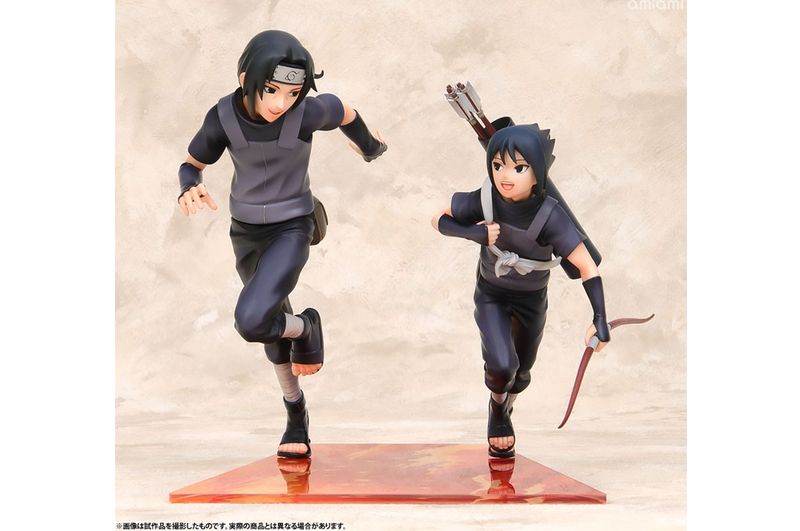 In addition to the figures discussed above, there are many more official Sasuke figures to be found on Amazon. 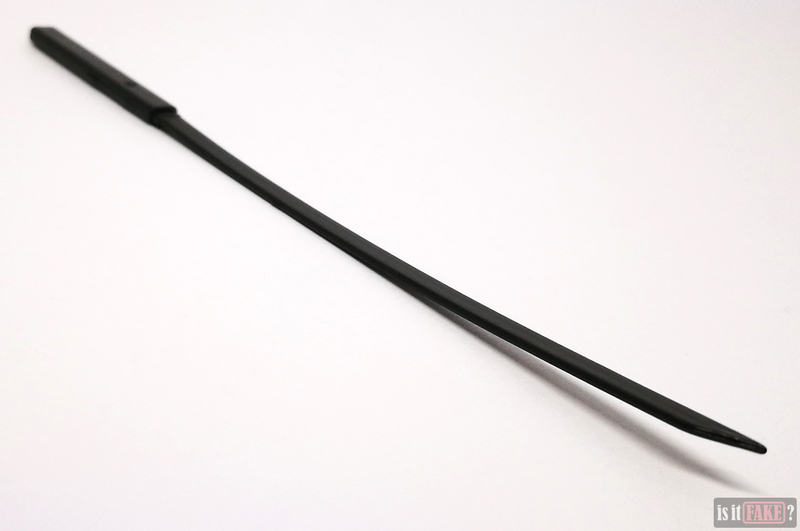 Most of them, however, are sold by third-party sellers. You must exercise extreme caution when purchasing from such sellers, as some are known to sell bootlegs. If you absolutely have no other choice, however, make sure you do some research on the seller first. Pay attention to their ratings, scrutinize their customer reviews, and if possible, ask around the internet if said seller is trustworthy. Only when you’ve amassed enough evidence to prove the seller 100% legit should you proceed with the purchase. Otherwise, look elsewhere.